Following requests from industry and with support from the State Government, Southern Waste Solutions set about establishing the state’s first Category C-cell waste disposal site in 2012. Tasmania has many industries that produce controlled waste as a by-product of their business, including agriculture, aquaculture, mining and manufacturing. Much of this waste is temporarily stored at worksites, including built up areas and on the shorelines of various bodies of water, risking contamination of waterways and the urban environment. A cell is simply another word for a securely lined landfill, or a site that is used to safely bury waste as part of the process of waste management. The Copping C-cell is a highly secure type of landfill that has been built to best practice and will accept Category C waste. It has been constructed adjacent to the existing B-cells at the Copping site, which currently house Category A and Category B waste. The C-cell is a carefully engineered and built structure located in solid, impermeable dolerite rock and lined with multiple layers of clay and impermeable man-made membranes. The Copping C-cell is a safe distance away from any water course, being approximately 2.5km away from the nearest river and its buffer zones are well in excess of EPA recommendations. 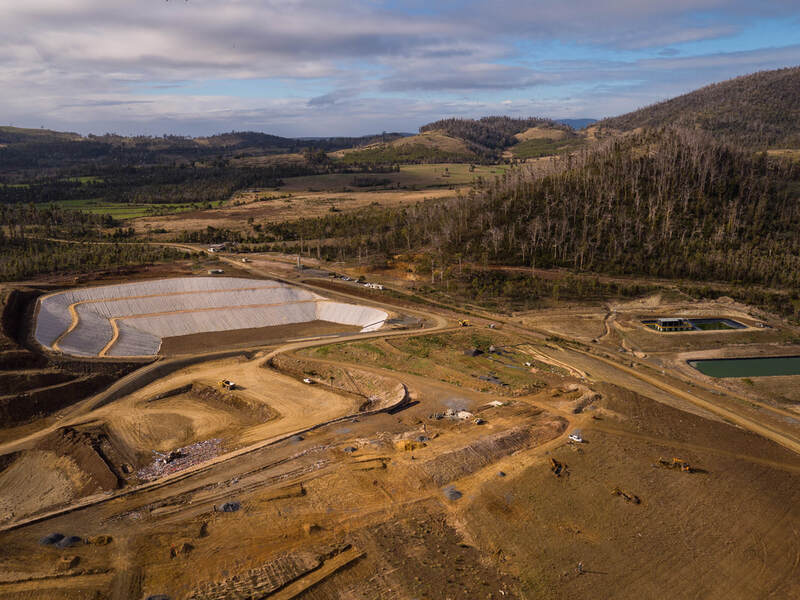 The purpose of the C-cell is to provide a sustainable and secure method of waste management in Tasmania by isolating waste from the surrounding environment (surface water and groundwater) in a structure that has been approved by the EPA. It undergoes regular monitoring and testing to ensure it meets all regulations and this monitoring and testing will continue indefinitely after the cell is closed and capped. A trust fund fully funded by gate fees will pay for post closure expenditure. The location of different kinds of waste will be mapped inside the cell with the goal of recycling or reusing it in the future should the opportunity present itself. The Copping C-cell is the first of its kind in Tasmania and is expected to provide the state with a waste management solution well into the future. The proposed facility will be engineered to world’s best practice and the waste will be stored in a manner to ensure it cannot cause harm to the environment through soil or water contamination. Under the terms of the permit to operate, no liquid waste will be accepted or placed into the controlled waste facility. Materials that will be accepted include solids and sludges such as contaminated soil, solid paint waste, building materials and industrial residues. All waste material will require prior approval from Environment Protection Authority before it is accepted at the facility. On arrival waste materials will be immediately unloaded and securely contained and covered within the facility to ensure no contamination can occur. The Copping landfill site is on some 704 hectares of land and it is anticipated the size of the controlled waste cell will be some 100 metres wide by 200 metres long. It will be located well above any flood zones, fully security fenced, with access limited to only authorised individuals. The existing Copping landfill site is recognised as a very well-managed facility with best practice environmental processes. It is not-for-profit as it is owned by a joint local government authority, made up of Clarence, Sorell, Tasman and Kingborough Councils. Copping is in an ideal location to service agriculture, aquaculture, industry and small businesses in the South of the state. It was also selected because of its excellent combination of stable geology and readily manageable surface and ground water. The proposed controlled waste landfill cell at Copping is the result of many years of research and planning. The following documents outline the various stages of this process. If you would like to be involved in the discussion, please see information about our Community Reference Group. For information regarding our past community involvement, see the documents below and our community news page. 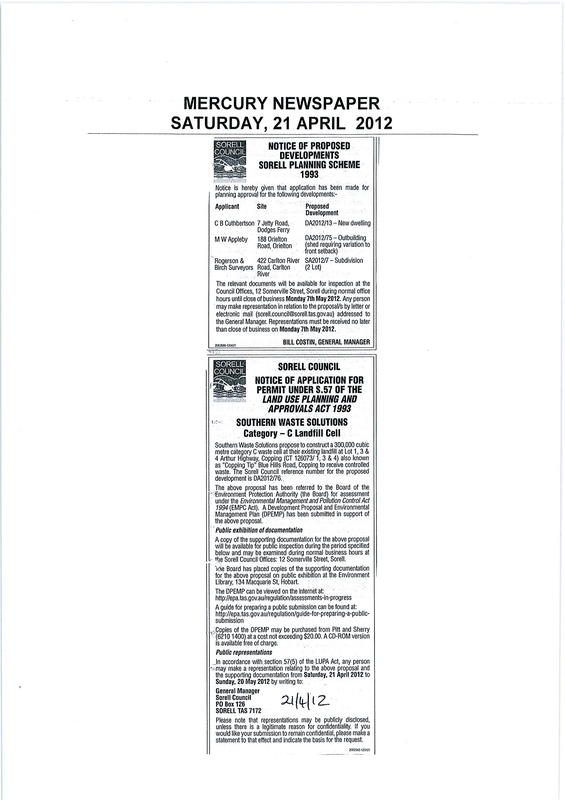 The following documents contain responses to some of the misinformation that has been published about the proposed Copping Category C waste disposal cell.